As fervent enthusiasts for celebrating our borough, when whispers reached us at Hackney Towers that the Savoy was serving up Hackney-inspired cocktails, we knew we had to investigate. Unperturbed by the daunting omnibus journey into town, Eat Hackney and I grabbed our best hats and headed up west! Suitably bedazzled by the lights of London and the hotel’s gleaming 1930s exterior, we strolled through the lustrous lobby to the refinement of the American Bar. 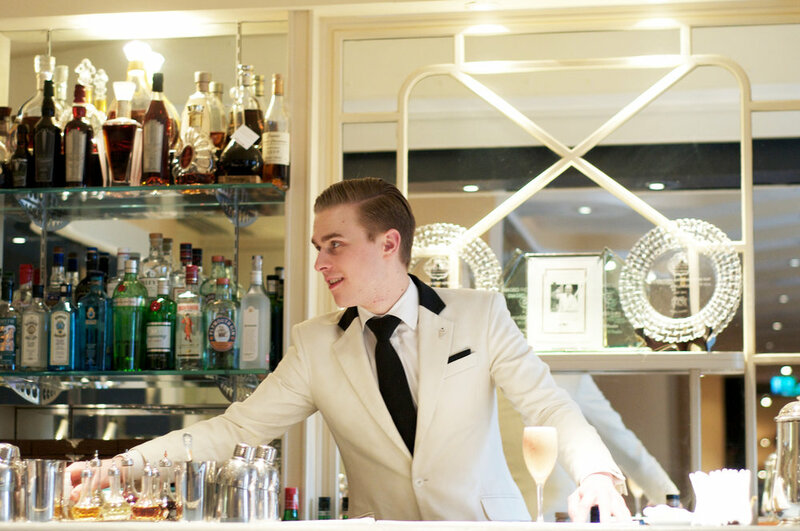 Whisked to our table, we watched with intrigue as the immaculately besuited and coiffed barman whipped up the evening’s drinks. The beautifully designed borough-by-borough menu starts in Westminster, where the Savoy is situated, and runs through the City, up to Camden and then heads east, featuring Hackney, Islington and Tower Hamlets. Within each area, four leftfield landmarks or legends are represented in liquid form. Inspiration for honouring these little-discussed London stories came when bar manager Declan McGurk discovered a hook in Russell Square, once used by policemen to hang up their coats while directing the traffic. The Policemen’s Hook, a dreamy mix of Haig Club whisky, Amontillado sherry, barley syrup and bitters is inventively served atop moss, and decorated with (very tasty) roasted kombu (edible kelp). Hackney’s highlights are suitably feted with imaginative cocktails dedicated to the borough’s grand buildings, film studios, and the humble hackney coach. The City Lights, celebrating the Hackney Empire, is a light and fizzy concoction of vodka, Cocchi Rosa and sparkling rosé, topped with a dainty little spray of pink buds. The Hackney Carriage, served in a beautiful glass designed to mirror the bar’s decor, is a traffic-stopping blend of rum, umeshu, vermouth and Laphroig. The storytelling Secret Agent, a glorious combination of bourbon, Laphroig, Cocchi Amaro, absinthe and egg white, came garnished with a gunshot, conjuring up the B movies and melodramas (including a number of Hitchcock’s) produced at Hoxton’s famed Gainsborough Pictures studios: find out how to make it below. Feeling suitably warm and fuzzy, we raised our glasses to these lesser-known highlights of Hackney and set off for home, happy in the knowledge that the world might know a little bit more about our favourite corner of London. Place all ingredients into a shaker with ice. Shake vigorously. Pour. Decorate with Peychaud’s bitters (bullet hole) and red cocoa butter powder (blood spatter).